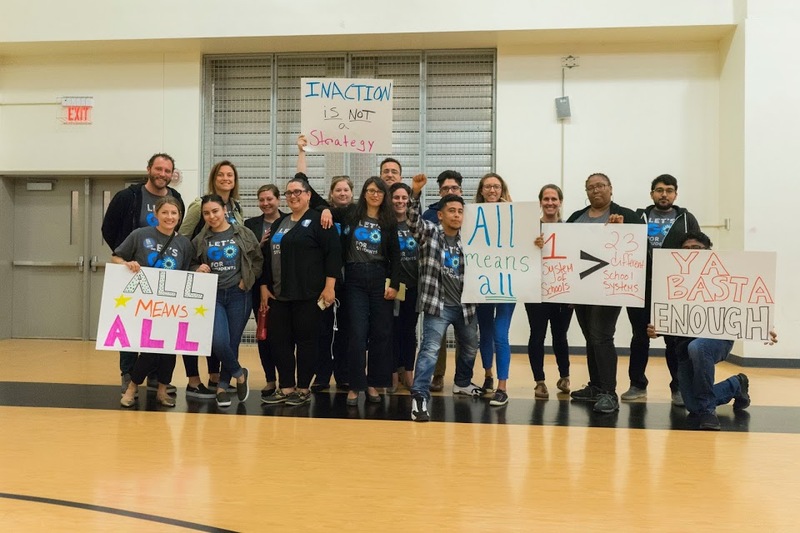 At their June 6th meeting, the OUSD school board passed a resolution to cut or re-allocate approximately $8M from the district’s 18-19 school year budget to build the district reserve to 2.5%. Reserve: Our current levels of financial reserves are below the state-required minimum of 2% (and well-below OUSD board policy of 3%). Inaction to build this reserve could result in our district losing local control and being taken over by the State of California. Painful Cuts: School communities had already started budgeting for the coming year with an understanding of how much money they had to spend. It is painful to pull some of those planned resources away from families and educators. This means that OUSD schools will likely see their school site budgets cut for the third time in the last two years. Improvement: In the past, lack of appropriate financial forecasting and planning has resulted in cuts that happen in the middle of the school year. It is an important improvement that district forecasting and planning has improved so that we can plan further ahead and implement necessary changes before the school year begins. Long Way to Go: While progress has been made in our financial practices, we are far from where we need to be. See our one-pager on how our current practices differ from best practices. Also see a troubling new report released this week from FCMAT, an agency that provides independent review of financial practices. The sobering reality is that without this action, OUSD is projected to have their reserve dip down to 1% at the close of the 2017-2018 fiscal year. As the reserve drops below the state-mandated 2%, there is increasing concern about the possibility of the district going into state receivership, again. What will happen in the short term? District senior leadership is currently exploring how they can make approximately $8M in cuts to the central office and school sites. The next step is for OUSD staff to present the school board with an update at tonight’s school board meeting with different options for how they can meet the board’s resolution (you can tune in to the live stream here tonight). During this meeting, the school board will see a first full draft of the 2018-2019 school year budget. There will be a tight turnaround between the board’s first opportunity to see next year’s budget tonight and the time when they will need to vote on the final budget on June 27th. What should happen in the long term to avoid unplanned district cuts? This year, GO Public Schools successfully advocated for an important first step in OUSD’s path to fiscal solvency — the adoption of a policy that sets the intention that the district implement national best practices in district budgeting. Now that the policy has passed, there is an increasingly urgent need for implementation of those practices. 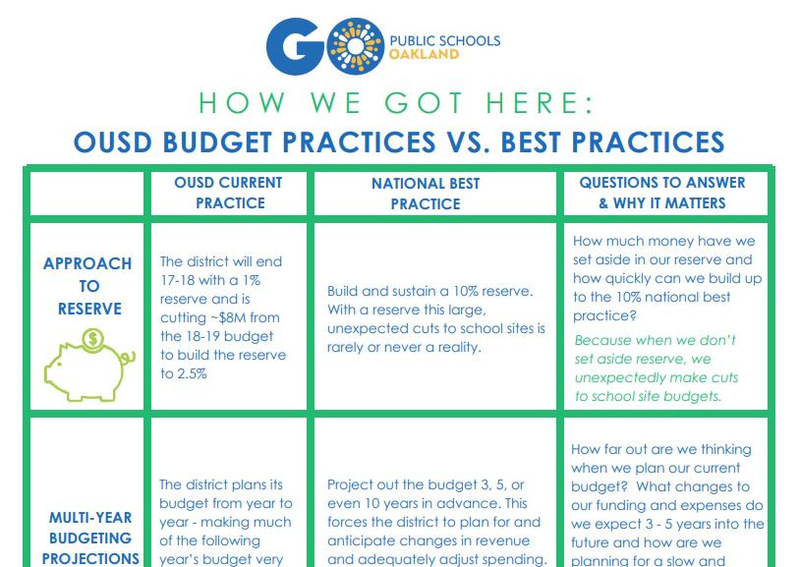 Check out our one-pager on How We Got Here: OUSD Budget Practices vs. Best Practices to understand more about how our district needs to update practices to avoid this type of pain in the future. The community’s role in asking the above questions and holding our district leaders accountable is absolutely necessary to make sure that we interrupt the pattern of correcting our mistakes by making cuts to school site budgets. Board President Aimee Eng shared that when the district plans for the 19-20 budget, they are expecting up to $25-$30M in more cuts, as state funding is flat and costs continue to rise. It is critical for OUSD to start the 18-19 school year with a detailed and transparent budgeting process that puts an emphasis on reducing central office expenses as much a possible, using an academic return on investment approach to justify the expenses that are maintained and which programs or departments are no longer affordable. This approach must also ensure that cuts to school sites are a last resort and communicated in advance of school communities starting their budget-setting process for the following year. Check out our graphic on OUSD’s Budget Challenges 6 Month Snapshot to understand more about OUSD’s budget challenge timeline this year. 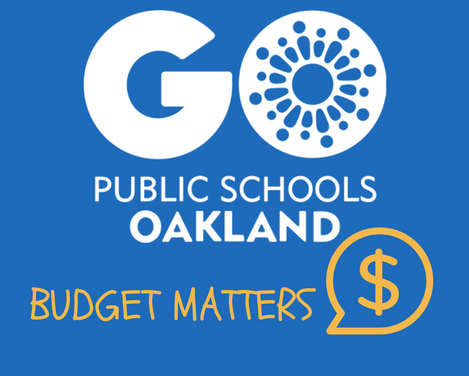 GO will continue covering OUSD’s budget challenges with updates after the board meetings tonight and on June 27th, including final decisions made about the unplanned cuts that will produce approximately $8M to build the reserve to 2.5%. As you are following these updates, please contact me at ntahai@gopublicschools.org to share your outstanding questions and your interest in getting involved to monitor the district’s implementation of best practices next year.